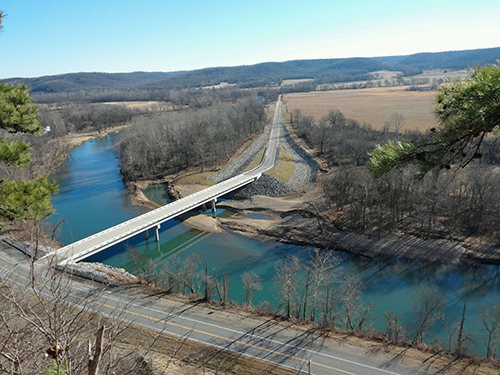 Manhattan Road & Bridge Company has been bestowed the Associated Oklahoma General Contractors (AOGC) 2016 Pharaoh Award for the Combs Bridge replacement project, which was constructed in Cherokee County, Oklahoma on Highway 10 over the Illinois River. The Pharaoh Award recognizes high-quality bridge structures in the state of Oklahoma. 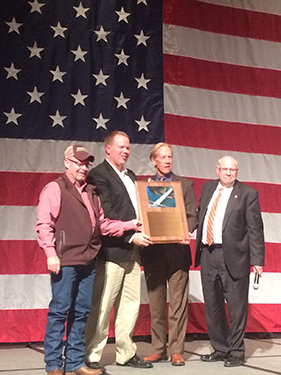 The award was presented to Manhattan Road and Bridge team members at the annual AOGC Banquet held on Friday, November 18 at the Embassy Suites Convention Center in Norman, Oklahoma. The $2.8-million Oklahoma Department of Transportation Combs Bridge replacement project was funded through the County Improvements for Roads and Bridges program. Construction began in the Spring of 2014 and was open by Labor Day of 2015. The project involved new alignment to replace the original Combs Bridge, which was built around 1926. Many longtime Cherokee County residents cherished the bridge because it provided a visual connection to the beloved children’s novel, “Where the Red Fern Grows” as it was featured in the opening scene of the movie. The new bridge was constructed about 2,000 feet downstream from the historic Combs Bridge and consisted of three spans with a total length of 420 feet and bridge beams weighing almost 70 tons each. In addition, 2,500 feet of asphalt roadway was placed.